We do receive internet in Oakland where there are many places to use computers for free and get free wi-fi. 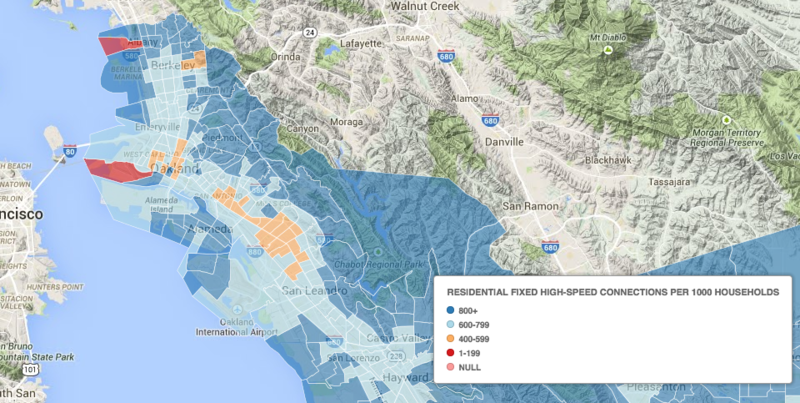 While many people in Oakland do have internet access, we're not at 100% yet. Please not that this map does not include mobile use. There are also a lot of discussions about Oakland that happen online, Oakland residents who build the internet, places where people learn and hack on the internet, a twitter-based civic accountability crew that's organizing a grassroots-organized mayoral candidate debate, and more. There are still many people who don't have access to the internet, but we're working on building this here internet resource (the wiki) out of the assumption that eventually most (hopefully all!) of us will be able to be a part of the collective human brain we appear to have created for ourselves.